Oscillators are a fundamental building block in many engineering fields, as they provide the basis for counting, timing and synchronisation. Oscillators are found in many everyday devices such as clocks, computers or radios. Similarly, oscillations are an essential part of biological systems – providing the basis for, for example, rhythmic patterns and regulatory networks. The ability to build a stable, controllable biological oscillator would be a major step towards reliable synthetic biology based circuits. Elowitz et al. were part of the first ones to try to build an oscillator. Their oscillator was based on genetic network at the single cell level. However, due to the stochastic behaviour inherent at the gene expression level, the oscillations were not stable or persistent. In this paper, we present an original oscillator design produced during the iGEM-2006 competition at Imperial College. The project addressed stability and reliability issues by defining an oscillator at the population level and by applying strict engineering rules to the system development process. BioBricks composing the test constructs and the final oscillator were engineered and a number of important results were extracted from the modelling and testing stages: i) The test constructs/BioBricks representing the different parts of the oscillator were characterised from testing in E. Coli (DH5α). ii) The model of the test constructs, which included experimental data, predicted stable oscillations as output of the full system. iii) The influence of specific system parameters on the frequency, amplitude and stability of the oscillations was investigated with the Lotka-Volterra model. In the project, fundamental units of the system were fabricated and characterised. These have been added to the Registry of Standard Biological Parts. 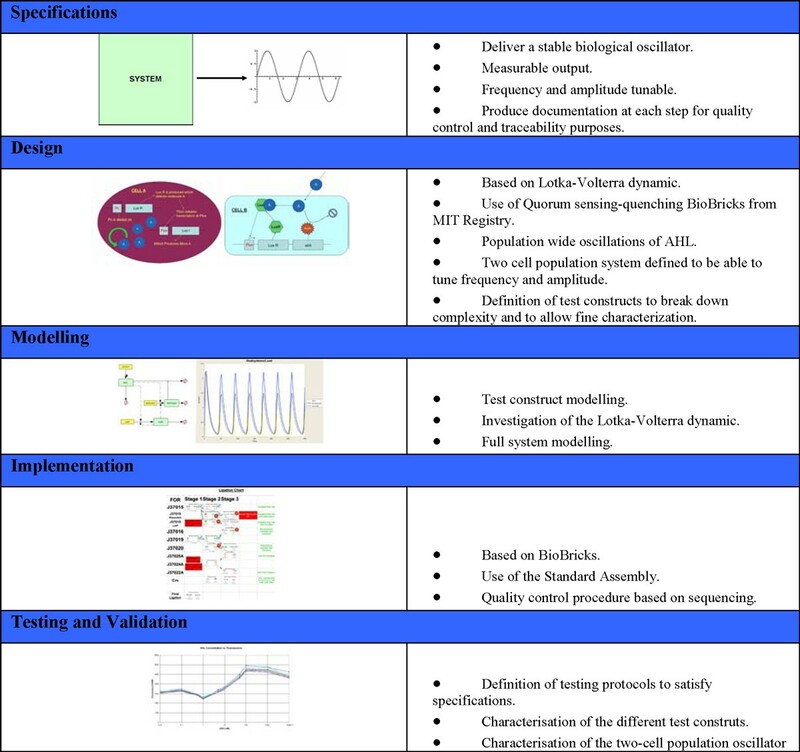 The modelling exercise was highly successful and we fully expect to complete a stable synthetic biology based oscillator to be completed in the near future. For full details visit our iGEM website http://openwetware.org/wiki/IGEM:IMPERIAL/2006.